Q: I'm moving and I've got a box full of cords that connect to various electronics. What can I chuck and what's really useful? A: We have this same issue. Look over your stuff carefully. Power users might want to hold on to nearly everything, but if you're just a regular Joe, here's what we'd keep. Keep any cable that connects to a headphone jack (3.5 mm). I particularly like the cables that are male on both ends. These always seem to come in handy, whether it's connecting your iPod to your car or your computer to some speakers. Keep any HDMI cable. These tend to be expensive. Don't want to lose them. Keep one short (3 to 6 feet) and one long (20 feet) ethernet cable (aka Cat5). Not that these matter as much as they used to, given the prevalance of Wi-Fi and laptops, but they are invaluable in troubleshooting problems with your broadband modem and/or your router. Keep any adaptors that can take one display to another. These come in a lot of shapes and sizes, but keep them all. This ensures that you can hook up any kind of monitor, projector, etc, no matter what kind of computer you or a friend needs to use. Keep three RCA cords around. 1. One audio cord with a headphone jack on one end and the RCA at the other. 2. One audio cord that's RCA on both ends. 3. One video RCA cord that has the yellow video cable in addition to the white and red of the audio cord. 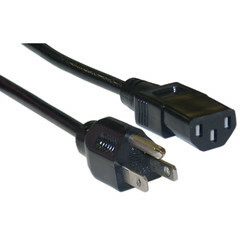 Keep any of those thick, black, three-pronged power cords. Why? Again, troubleshooting. That's a small box of stuff. Everything is probably just a tangled, motley mass headlined by old cell phone chargers, you should throw out dispose of responsibly.